A bat's eye view from the Ann Richards Congress Avenue Bridge, looking east. There are several ways to see the bats emerge, and even other places than downtown to see them! WHEN ARE BATS IN CENTRAL TEXAS? Mexican free-tail bats arrive in Central Texas in the early spring and hang around until the first cold front in late October to mid-November. In June, mama bats give birth to one pup, and these babies are ready to fly by mid-August (which is why emergences peak, since the colonies can double at this time of year). It’s good to remember that the emergence of the bats relies on many factors, including the time of year and the weather. You can call the “bat hotline” at (512) 327-9721 to see when bats have been emerging downtown. That said, some evenings, it’s hard to see anything, and sometimes, swarms of bats dot the sky. Loud noises and bright lights can disturb the bats and negatively impact their emergence. Keep in mind that if you sit underneath where bats emerge, you run the risk of having guano fall on you, so you might want to bring a light jacket or a hat. Checking out the bats on a bat sightseeing cruise. WHERE CAN I SEE THE BATS? The Ann W. Richards Congress Avenue Bridge, by day. Many people gather on the grassy hill to watch the bats emerge at dusk. Take a boat tour. Capital Cruises and Lone Star Riverboat both offer public sightseeing cruises which are about an hour in length. Departure times vary slightly, depending on what time of year it is, and you do need to arrive a bit in advance. Compared to hanging out on the ground, this is a little more comfortable, and you can usually snack on the boats while you listen to the guide tell you more about different spots along Lady Bird Lake. If you have kids who have a hard time sitting still or who have a daredevil streak, this option might be too stressful to be worthwhile. You can read more about this option here. Canoe or kayak to the bridge. If you have your own canoe or kayak, you can get up close and personal with the bats, along with anyone else who has the same idea. Several vendors rent canoes, kayaks and paddleboards near the bridge. You can also book a bat tour with The Texas River School, which hosts a monthly Moonlight Bat Float, complete with music from local musicians and which benefits the nonprofits work to take at-risk kids for adventures on the water (read more about that here). Live Love Paddle also hosts bat tours. Enjoy the view while you eat. 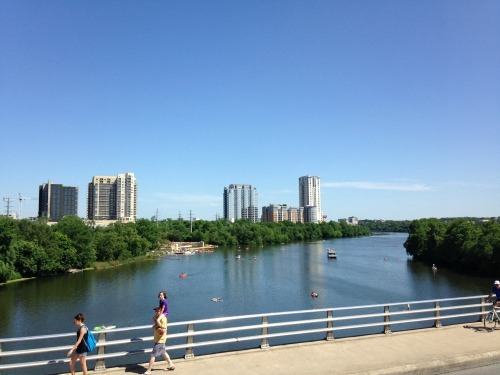 The north side of Lady Bird Lake has several hotels which claim to have the best bat watching which have restaurants. One casual option is Alta’s Cafe, which is located atop the Waller Creek Boathouse. There are a few piers along the north side of the Lake which also offer a great vantage point to see the bats. “Nightwings” is a public art piece at the traffic island at the intersection of Barton Springs and Congress. What’s your favorite way to see bats in Austin?